Vacuum: By vacuuming your upholstery on a regular basis, you will prevent dirt from becoming ingrained in the fabric. If dirt gets trapped in the fabric, your furniture will wear out quicker because the dirt particles rub against each other breaking down the fibers. Direct Sunlight: Keep your furniture out of the direct sunlight. The sun can actually fade your upholstery over time. Spot Cleaning: Let’s face it, spills happen. When they do, act quickly. Remove as much of the spill as possible without rubbing. And never saturate your furniture with any moisture. A little bit of water or a Chem-Dry Spot Remover will work wonders. If that doesn’t completely lift the spot, call a professional so you don’t permanently set that stain. Moving Furniture Around: Many of us like to move our furniture around in the room for a change of pace. Keep in mind when you move that piece of furniture, lift it rather than “drag” it around the room! “Dragging” the furniture around can cause structural damage! Use a Professional Cleaner: By professionally cleaning your furniture it will look nicer and will be healthier for your family. Furniture cleaning will brighten most upholstered fabrics and by removing unwanted dirt from the fibers the life of the upholstery will be prolonged! 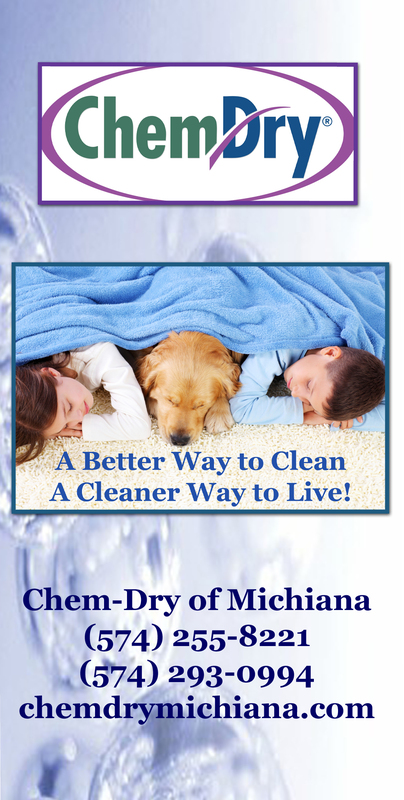 Cleaning the South Bend, In and Elkhart, IN areas since 1987! This entry was posted in Furniture Cleaning and tagged upholstery cleaners, upholstery cleaning tips. Bookmark the permalink.